Last time, for those of you not paying attention or somehow reluctant to scroll down and see the last post, I discussed the Electoral College and its historical background, and how it means we don’t elect our president by a direct popular vote. There are a two proposals that have been getting serious consideration. The first is the “National Popular Vote Interstate Compact”. States signing the compact agree to assign their electors according to the national popular vote. The compact takes effect when states contributing a total of 270 electoral votes (enough to win the election) have signed on. Maryland was the first state to sign the compact in 2007. So far, ten states and the District of Columbia have joined – a total of 165 electoral votes. It has its problems, of course. It could actually require a state’s electors to vote for the candidate who did not win the popular vote in their state. That’s a serious matter in our “federated republic”. There are some legal issues as well. And of course, getting enough states to have the compact take effect means getting a lot of small states – who would lose influence under the method – to go along. Another possible method is the “Congressional District” method. Nebraska and Maine actually use this method right now. Since it happens that each state is divided into districts (equal to their number of Congressional representatives), this method assigns an elector to each district, and has them vote according to the popular vote in their district. The other two electoral votes in the state go to the overall popular vote winner in that state. The biggest problem with this method is that the borders of the districts are created by the states. It is far too easy to gerrymander the districts to swing things to favor the party that controls the state legislature. There’s enough data available to see how things would have turned out in past elections if an alternative method of choosing electors was in effect. Over at the excellent “270 to Win” poll-watching site, there’s a nice little interactive map that lets you play around with some of the proposals. Keep in mind that campaign strategy is based on how the Electoral College actually works. Change the rules, and you change campaign strategies. “Swing states” may be replaced with “swing districts”. It’s still kind of fun to see what might have happened. 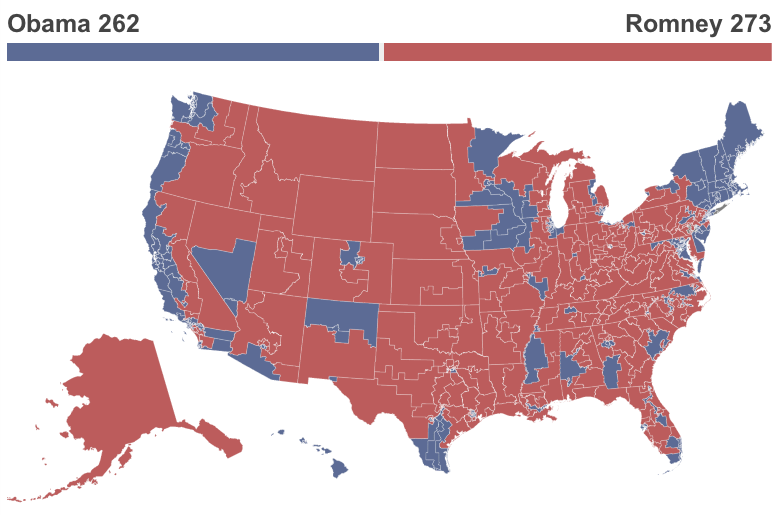 What would the 2012 map have looked like if everyone used the Congressional District method? Are you sure you want to reform the Electoral College? President Romney would be much better than President Trump. Personally? Even President Pence would probably be better…….